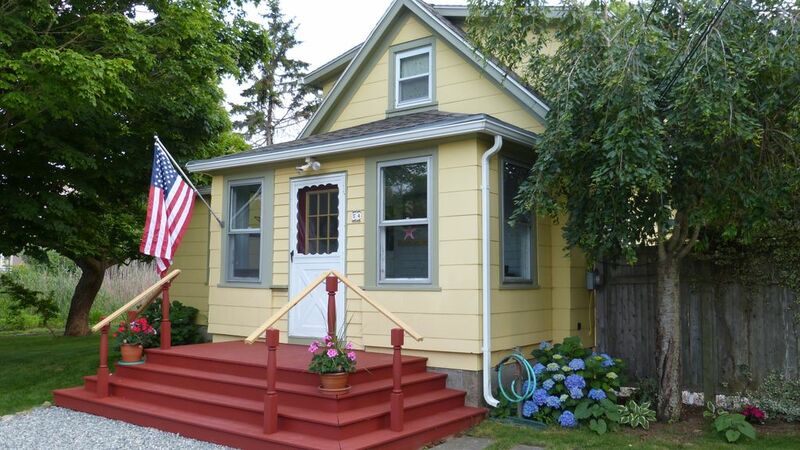 This cozy two bedroom bungalow is located in beautiful Mystic, CT within a five minute drive to the Mystic Seaport and Mystic Aquarium. Plenty of activities such as visiting Downtown Mystic, Olde Mistick Village, Mystic Drawbridge, Stonington Borough, local beaches, and golf courses. About 20 minutes away from the excitement of Foxwoods and Mohegan Sun casinos. Relax in this fully furnished home, featuring a master bedroom with a Comfortaire king bed, closet and full bath with claw foot tub, a 2nd bedroom with a Select Comfort queen size bed and ensuite 1/2 bath. All bedding is 300 thread count Egyptian cotton with plenty of warm blankets and comforters. Relax in the enclosed patio with round table and retractable umbrella. Other amenities: 55-inch flat screen TV in living room, 19-inch flat screen in kitchen, 32-inch flat screen in master bedroom, outdoor shower, large front and back yard to accommodate ball playing, patio chairs, towels, linens, pull-out queen size sofa. Mini-split ductless air conditioning means no more noisy window a/c units. Washer & dryer available for week or longer stays. My wife and I have always loved to travel. When we found out we could rent homes for a little more than a hotel, we always decided to rent someone's vacation home and never looked back. We fell in love with this property due to its old age and the beautiful property it sits on. It has unique features that they don't make anymore in the newer homes. The bungalow was built in year 1900 and was built to last. There is no inside shower - only an inside claw foot tub and an outside shower. It is a 15 minute walk or a 3 minute car ride to the Mystic drawbridge. No telephone is provide but cellular service/reception is excellent. Mini-split ductless air conditioning was added in 2015 (better than central air). Each bedroom now has a whisper quiet wall mounted air conditioner. The living/dining/kitchen has a large main unit. Steam heat with cast iron radiators. I have fine-tuned this system myself and gives off heat like a miniature wood stove in each room. Sofa with pull-out queen bed. Recliner chair with swivel and glider. Blu-ray/DVD player connected to the living room HDTV. Assorted Blu-ray & DVD movies available. Enclosed patio with round picnic table, four bench seats and retractable umbrella. Two cedar Adirondack chairs. This bungalow is amazing- comfortable beds, beautifully appointed, great back yard, cool claw foot tub! James, the owner, is very responsive and accomodating. Only wish we could’ve stayed longer! This is our second stay at this property and it works very well for us. The stairs to the upper bedroom are fairly steep, but have a solid handrail. The outdoor shower is fine when the weather is fine, and there is an ample tub in the upper bath. There is an enclosed porch area for removing shoes and robes and house shoes are available. There is plenty of equipment for cooking, microwaving, making tea or coffee. With a week long stay, we had access to the washer/dryer in the basement. Internet service is fine. We had a beautiful show of color from a maple tree on the property, and we enjoyed walking down to Mystic Market East for breakfast and takeout. We'll be back! A well equipped and well situated cottage in beautiful mystic. The King bed in the upstairs room was very comfortable - extraordinarily so! Well equipped kitchen. Overall, a great stay with articulate instructions and expectations. Thank you! The bungalow is adorable and super clean. Well appointed and kitchen works (but small). If you are very tall the stairs and upstairs attic are a little tight. We had three adults and it worked well. It would be nice to have an indoor shower. Our daughter used the outdoor shower and thought it was great. We loved our stay. It was the perfect size for our small family. Wonderful amenities and close to so many great attractions. Good neighborhood for walking and riding bikes, too. We've already begun considering a return trip! Perfect accommodation for our group of 5. Beds were comfortable. An indoor shower would have been nice, but we adjusted to the outdoor one. Close to attractions and easy to find plenty to do without traveling far. Stays longer than two weeks may have an increased cleaning fee and/or security deposit.